We are coming to probably one of the best known verses in scripture. We stop just short in our study today because that section gets a bit of special attention. Today we join Jesus, His disciples and Nicodemus. Nicodemus is a slightly brave man. He is a member of the Jewish ruling council. I believe he was part of the Sanhedrin, the group that condemned Jesus to death. Nicodemus didn’t vote their way through, but that will come much later. Today, Nicodemus can’t take it any longer! He needs to know more about Jesus, but he is concerned about his reputation and status within the council. He can’t be seen openly seeking Jesus out for true understanding. He could easily have come along any one of the times the religious leaders tried to entrap Him. But that is not what Nicodemus is wanting to do. One of the first things that strikes me in this passage is Nicodemus’ greeting to Jesus. I don’t know if he was trying to insulate himself with his word choice or if he really meant what he said to Jesus. “Rabbi, we know that you are a teacher come from God, for no one can do these signs that you do unless God is with him” (verse 2). So who was the “we?” EVERYTHING Jesus did the religious leaders tried to discredit. Were they secretly talking among themselves and confirming that they KNEW His origin? Or was Nicodemus generalizing a bit and maybe buttering up Jesus, as so many of his fellows had done and will continue to do? I truly believe Nicodemus’ heart was searching for answers. I don’t believe he would have come at night if he wasn’t. He was doing a “cover your assets” move this way. I would like to step into our story tonight and walk in Nicodemus’ sandals. The whole city has been stirred into a frenzy this week. Jesus, from Nazareth, has been teaching and working miracles in the streets and in the Synagogue. Everywhere He goes people follow Him and press in on Him. The city’s religious leaders have been beside themselves all week trying to convince the people that Jesus is nothing more than a charlatan. They are fighting a losing battle because every miracle He does just increases the people’s desire to be near Him. Frustrated and weary, each night the leaders get together to discuss how to stop this trend. In the council chambers you can hear the discussion heating up. A begrudging chorus of ascent is heard around the room. Nicodemus is in agreement about the fact that Jesus must be from God, but is comfortable with nothing else being proposed in these sessions. Every night he goes home a little surer that Jesus is exactly who He claims to be. Every night he is more conflicted about his role in this body. He wants to be a good leader but the people he observes interacting with Jesus have something he wants too. They have certainty and peace. Tonight Nicodemus is determined to find some of that peace for himself. After the meeting breaks up he doesn’t head home like he usually would. Instead he sneaks out of the city and goes to where Jesus and His disciples are staying. It is a little house on the outskirts of the city, hidden in a grove of olive trees. As he approaches he hears Jesus and several of His disciples talking. He almost turns back out of fear, but his heart is burning for answers. As he approaches the home he sees that the group is sitting on the stones surrounding the home’s small garden. Everyone appears so relaxed. 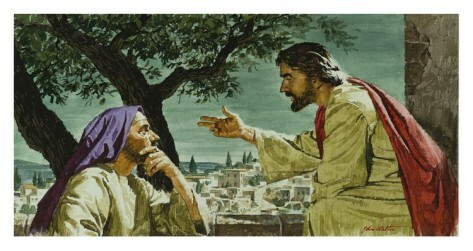 Peter is the first to notice Nicodemus’ approach. Peter wants to challenge him but isn’t sure how Jesus wants to handle this. Nicodemus walks over to where Jesus is sitting. All eyes are on him now and he feels the full weight of their suspicion. Nicodemus really looks lost now. He does not understand where Jesus is going with His explanation, but he is trying to follow Jesus’ train of thought. Nicodemus’ eyes widen at Jesus’ statement and the fact that Jesus indicated Himself as the ‘Son of Man’ by placing His hand on His chest as He spoke! Nicodemus is hooked! He has to know more! But this is where we are going to leave Nicodemus for tonight. Tomorrow we will follow him into the deep end of the pool. The end where he loses himself, only to be found by Jesus; and us too. Lord Jesus, THANK YOU that You didn’t turn Nicodemus away when he came seeking. Thank You that You met him where he was. You didn’t stop Your explanation and tell him he was hopeless as a student. You broke it down for him bit by bit. Thank You that You saw his searching heart. I don’t think he came all the way to full understanding that night, but Your seeds went deep into his heart. Father God, You never fail to answer my heart when I’m truly searching. You take me onto Your lap and guide me once again through “our scrapbook.” Sometimes I get wrapped up in the details and miss the whole picture. Other times I miss what is hidden in plain sight. But You always bring me to the places I need when I sit with You for a while. Help me be still long enough to see the whole story. Don’t let me jump off Your lap too soon. Snuggle me in a little deeper until I am focused once again on what You want to show me. Forgive me for being so thick headed or flighty at times. I really do want to hear the WHOLE story.